February may be the month of love and passion but, for me, that doesn’t necessarily translate into flowers and dinner reservations. Passion doesn’t have to stop with romance. It’s about embracing everything that excites us and gives us purpose. It’s just as much about the “what” that inspires us as it is about the “who” that joins us on our journey – which is why, this month, we’re talking passion projects. I recently embarked on my own exciting project in 2018 and it was an endeavour I’ll never forget. For years I had talked about writing a cookbook in honour of my sister but I could never have anticipated everything that goes into creating something like that from beginning to end. No matter what your passion project might entail, I’ve learned enormous lessons worth sharing that apply to personal ventures of this kind. A passion project by definition is something that lights you up and brings you joy. It may not necessary make you rich but it it’s a project with a personal importance that will have an impact on your life. It’s a project that excites you and one that you can’t wait to put your time and energy into. For some it may be a side venture that may someday evolve into a full time gig or, for others, it may just be a meaningful project you’re simply driven to complete. My passion project was somewhat built out of tragedy. Eight years ago my younger sister passed away suddenly and in the years that followed I found spending time with her kids therapeutic. I love to cook as did she so my time spent with my nieces and nephew were in the kitchen as we began cooking together. I wanted to teach them to cook the recipes that their mom and I had grown up with. The kids would come over weekly and we would cook together and capture the recipes in Evernote for future reference. Before I knew it I practically had the entire cookbook jotted down in my phone. And with a little prodding from loved ones, I decided to turn those notes into something more tangible and meaningful to our entire family. I love cooking, so I relished every opportunity to find recipes and test. Sharing food with the kids, my family and friends brings me great joy but when it came to organizing and building and self publishing the actual book, I really got stopped in my tracks. I shared with everyone what I wanted to do and where I was struggling. You will be amazed by the amazing advice and support that your community can provide you when you’re open to it. The first big breakthrough for me was someone pointed me in the direction of a website called Blurb where you can self publish and publish on demand. The other great thing about sharing is that inherently creates accountability. Once I had shared with everyone in my life, it made it pretty much impossible to abandon this little passion project no matter what I came up against. Full disclosure – the cookbook idea has been percolating in my head for about 6 years but, as it does, life happened and it was set on the back burner. In January of 2018 I decided to set some goals for myself for the year. The kids were growing up and my commitment to completing this project for them outweighed my excuses for procrastinating. 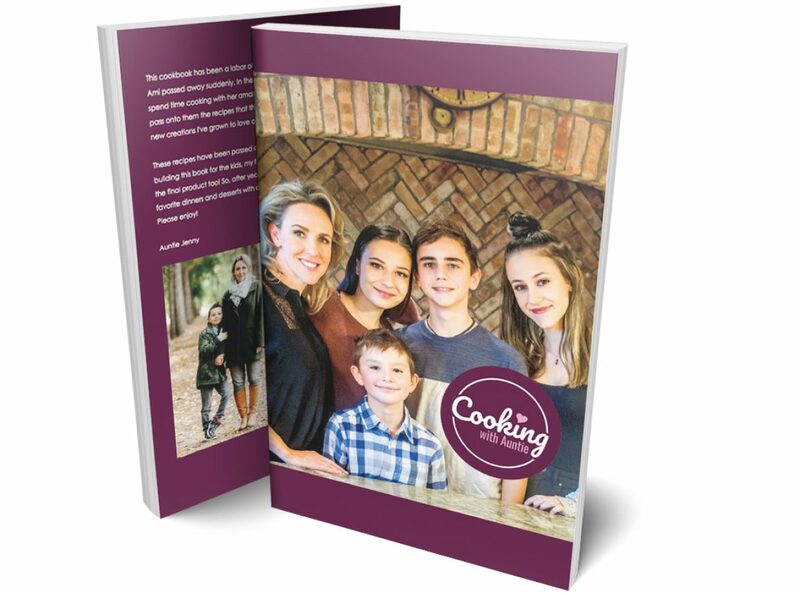 So I made a decision – I was going to do whatever it took to complete the cookbook so that I could give it to the kids as a Christmas Gift. As an event planner I’m accustomed to blocking out my time and setting deadlines for each stage of any project I’m working on. Like any big undertaking I believe it’s vital to break down your project into manageable parts and dedicate time each day, week or month to ensure nothing becomes overwhelming and progress is constantly being made. With this in mind, I began scheduling cookbook time into my calendar every single week. That saying Rome wasn’t built in a day is very fitting. At the beginning of 2018 I had nothing but a bunch of recipes in an app. Slowly as the year moved on I progressed from translating recipes manually to discovering YouTube tutorials that showed me other tools that made this process so much easier than I could have ever imagined! The more I talked about my passion project, the more I discovered how much support I had and the degree to which my friends and family truly wanted to contribute. The lesson? If you hit a road block – ask for help. If you discover an element that is outside of your skillset – ask for help. In my case I have amazing friends who contributed to the look and feel of my book that I know I could never have done on my own. Life is funny that way, we are always better together. At the very heart of your project, you need to know your WHY. Why spend the time? Why the effort or the stress or the money? What makes your passion project worthwhile for you? While I didn’t track it, I could estimate that I spent well over 300 hours working on the book last year. My why was a promise I made to my nieces and nephew after their mother passed away. I wanted them to have the book that we created together to honour my sister and celebrate our family – and every ounce of effort made it one of the best projects I’ve ever taken on. I completed my passion project in November of 2018. Its aptly called Cooking With Auntie. And I presented it to the kids on Christmas day as I had planned. It’s truly amazing to see something you are passionate about live in the world and witness the impact it has on others. I was humbled by the number of people who not only helped me through the process but those that were actually willing to purchase my book once it was complete and enjoy the recipes with their own families. The greatest gift for me, is that I feel like I have left a legacy my sister would be proud of. And I was reminded how powerful we can be by committing to our own goals and completing something through passion. If you’re interested in seeing what Cooking with Auntie is all about, its available for purchase at www.cookingwithauntie.ca in hard copy and I just created an eBook too. You can also follow along on my Instagram feed for even more recipes and cooking inspiration from my kitchen to yours. Who knows, maybe there will even be a second edition one day.